Last month, the Pew Research Center released a survey showing that a question about gun policy we have been asking since 1993 had passed a key milestone: For the first time in more than two decades, a higher percentage (52%) said it was more important to protect the right of Americans to own guns than to control gun ownership (46%). The survey question has drawn criticism from gun control advocates and some experts on gun violence, who called it simplistic, misleading and even biased. They say that forcing respondents to choose between polar positions – “gun control” or “gun rights” – assumes that all regulations on gun sales infringe on gun owners’ rights. This question presents respondents with simple, stark alternatives: When the issue of guns is raised, do you find yourself more on the side of protecting gun rights or controlling gun ownership? There is no indication that people have any difficulty answering this question or are ambivalent about the topic. In fact, when asked a follow-up about the strength of their opinion, 81% of those who said it is more important to control gun ownership felt strongly about that position; 91% of those who said it is more important to protect gun rights felt strongly. How a person answers this question doesn’t presuppose how they might feel about any specific gun policy. In fact, it is not intended to measure opinion about proposals to restrict gun sales, to limit the ability of dangerous individuals to obtain guns or to put stricter background checks on gun purchases – all of which the Pew Research Center has asked about in recent surveys. Rather, it is a gauge of broad sentiment over time on an important topic. In this regard, it is similar to “gut check” measures on other topics, such as, “Do you think the use of marijuana should be made legal or not?”, whether homosexuality should be accepted or discouraged by society, or whether abortion should be legal or illegal in all or most cases. None of these questions fully capture the nuances of public attitudes on these complex subjects. For instance, the widely cited trend on marijuana legalization, which dates back more than 40 years, does not specify the purposes for which marijuana might be made legal – recreational use, medicinal use or both? Yet each of these questions – on marijuana, homosexuality, abortion and guns – enables us to measure long-term change in the overall climate of public opinion and, equally important, how views among demographic and partisan groups have changed over time. Because no single question can possibly paint a full picture of opinion on an issue, the Pew Research Center covers public policy from multiple angles. On gun policy, we have conducted polls exploring attitudes about a number of proposals, including stricter background checks on gun purchases, preventing people with mental illness from purchasing guns and establishing a federal database to track gun sales. Our January 2013 survey found that many of these proposals drew extensive public support (see “In Gun Control Debate, Several Options Draw Majority Support,” Jan. 14, 2013). Other recent polls have looked at the differing perspectives of gun owners and non-gun owners and the potential impact of stricter gun laws in a number of areas, including whether such laws would reduce the number of deaths in mass shootings. Even after the Senate defeated a background checks bill in 2013, we found that 81% favored making private gun sales and sales at gun shows subject to background checks (see “Broad Support for Renewed Background Checks Bill, Skepticism About Its Chances,” May 23, 2013). The Pew Research Center’s public opinion research, including our surveys on gun policy, is part of its broader mission as a nonpartisan research institution that studies the issues of the day. The Center does not take policy positions and does not engage in issue advocacy. It shares its research with the public to generate a foundation of facts that enriches the public dialogue and supports sound decision-making. Examining trends over time is invaluable to understanding public opinion and is a core component of the Pew Research Center’s work. The question about gun control and gun rights was first asked in December 1993, a time when former President Clinton’s gun proposals – and his attempt to curb the power and influence of the National Rifle Association (NRA) – drew broad public support. In that survey, 57% said it was more important to control gun ownership while just 34% said it was more important to protect gun rights (see “Public Backs Clinton on Gun Control,” Dec. 10, 1993). On 11 occasions between 1993 and 2008 (the question was not asked 1994-1998), majorities consistently said it was more important to control gun ownership than to protect the right of Americans to own guns. Since 2009, however, opinion has been more evenly divided. In April 2009, 49% prioritized controlling gun ownership – down 11 points from just a year earlier – while 45% prioritized protecting gun rights. Opinion was little changed over the next three years. But in December 2012, shortly after the school shooting in Newtown, Conn., a higher share said it was more important to control gun ownership than to protect gun rights (49% vs. 42%). 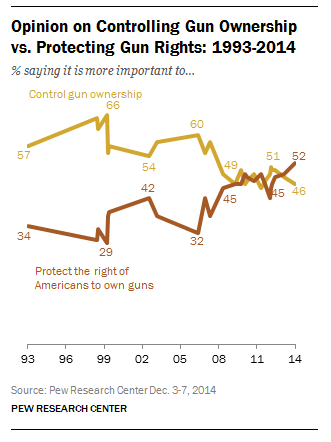 By May 2013, opinion was, once again, divided (50% said it was more important to control gun ownership, 48% said it was more important to protect gun rights). And last month, by a six-point margin (52% to 46%) more prioritized gun rights than gun control. 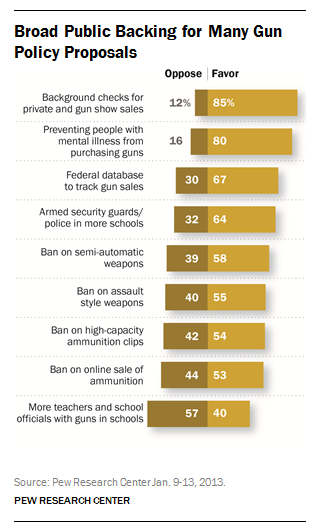 The broad shift in views on this question has been mirrored in other trend measures on gun policy. For example, in October 2014 Gallup found that 47% said laws covering the sale of firearms should be “more strict,” down from 58% in December 2012. From 2000-2008, majorities typically favored making laws covering the sale of firearms more strict; support for stricter gun laws fell in 2009, increased after the Newtown shooting, and has declined since then. And while there are few long-term trends of opinion regarding individual gun policies, surveys have found a decrease in support for some of these proposals. An April 2013 ABC News/Washington Post survey found that 56% favored a nationwide ban on assault weapons, down from 80% two decades earlier. 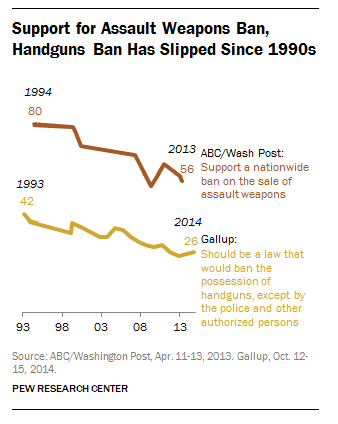 Gallup found that support for banning the possession of handguns fell 16 points between 1993 and 2014. As noted, one advantage of any long-term trend question is the ability to measure how views have changed among different groups. In the case of marijuana legalization, age is a major factor in changing attitudes. 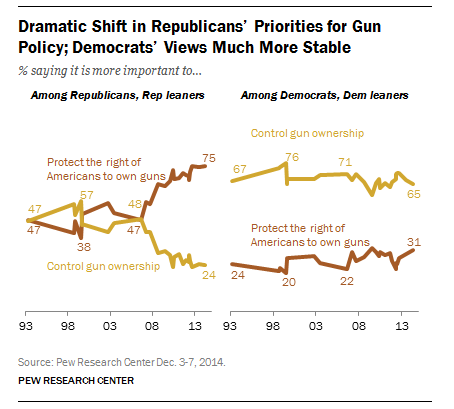 On priorities for gun policy, growing partisanship has been responsible for much of the shift in opinion. In the 1993 survey, Republicans and Republican-leaning independents were divided over whether it is more important to control gun ownership or protect gun rights (47% each). As recently as 2007, 48% of Republicans and GOP leaners said it was more important to control gun ownership, while 47% said it was more important to protect gun rights. Since 2007, Republican attitudes have undergone a dramatic change: The share of Republicans saying it is more important to protect gun rights has increased by 28 points to 75%. By contrast, Democratic opinion has remained much more stable. In December, about twice as many Democrats and Democratic leaners said it was more important to control gun ownership (65%) than to protect gun rights (31%).